Comprehensive plans are meant to consider the broad range of forces that impact a community and plan for the strategic use of resources to respond to these forces. Until Comprehensive Plan 2025 was adopted the City largely relied on area-specific master plans to guide change, but lacked a city-wide comprehensive plan that dealt with interrelated policy and budget issues. The plan contains a vision for the future—pertaining to physical assets, government services, local business and institutions, and cultural resources—and identifies policies, actions, regulations and investments that the City will pursue to achieve this vision. Putting these goals and action items in writing will also let the public know what the City intends to accomplish in coming years, providing predictability to developers and property owners, area institutions and employers, and other government agencies. These goals and policies are interdisciplinary and their implementation will require the coordination of all City departments. In doing so, the Comprehensive Plan should guide the preparation of future operating budgets and Capital Improvement Programs, in addition to departmental operations, City regulations, and other regional plans and funding decisions. 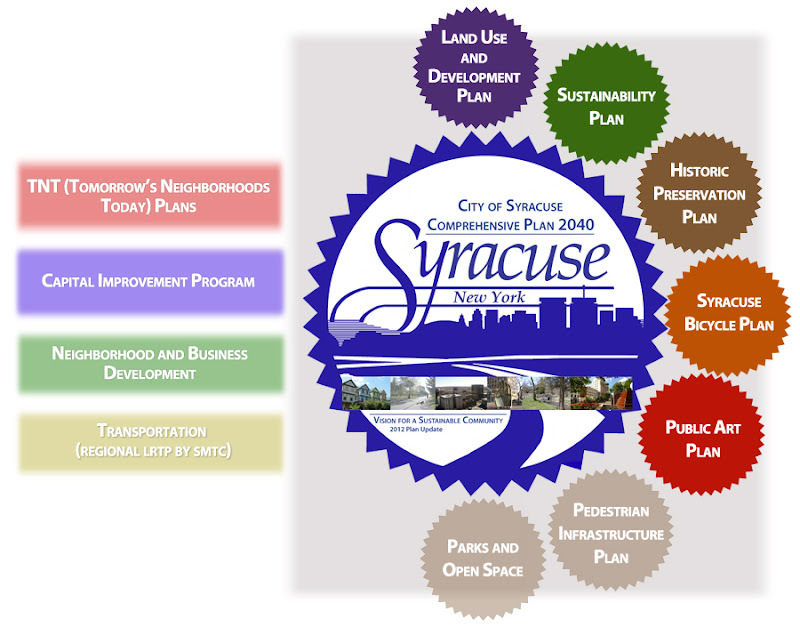 Comprehensive Plan 2040 is an update to Comprehensive Plan 2025, which was adopted by Syracuse Common Council in 2005. While Comprehensive Plan 2025 called for an update every five years, the Bureau of Planning & Sustainability was created in 2010, at which time it began developing additional components and updating the Plan with a level of detail adequate to guide implementation. With the addition of the component plans described below, much of the content of Comprehensive Plan 2025 became redundant and has been removed. Since that plan was adopted in 2005, TNT areas had developed five-year plans which helped to identify many common goals at the neighborhood level; and the 2010 U.S. Census was released, indicating that the City’s population has begun to stabilize, while some neighborhoods have grown and others have continued to shrink over the past decade. All of this new information was incorporated into the Comprehensive Plan 2040. 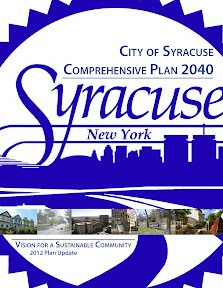 The Comprehensive Plan 2040 was unanimously adopted by the Syracuse Common Council on March 17, 2014. Access the Comprehensive Plan and each of its components by clicking on the emblems below. The center emblem links to the main body of the plan.